The Sharon D. Lund Foundation’s generous gift includes $500,000 to strengthen endowment as a matching challenge. The Sharon D. Lund Foundation’s long-time support helped build this organization to its present capacity. Sharon Lund co-founded Ryman Arts 25 years ago, along with Anne and Buzz Price, Lucille Ryman Carroll, and Leah and Marty Sklar. It is hard to believe it all started with a dozen kids in a warehouse studio, and Sharon helping founding executive director and sole employee Marshall Ayers to acquire a computer! “My mother really believed in the way Ryman Arts transformed young lives with art. Today, I see how much this program means to the students and alumni I meet here. We want to keep it growing, and encourage others to get involved, too,” says Michelle Lund, Ryman Arts Board member and daughter of Sharon D. Lund. A $500,000 gift will support Ryman Arts’ annual operations. Another $500,000 has been set aside as a challenge that must be matched by others. Our most pressing needs is to ensure that Ryman Arts remains free of charge to the next generation of artistic youth. Enrollment has doubled over the past two years; with increased costs. The Ryman Arts Board envisions a future with additional expansion to serve more talented youth. Our team is rapidly building traction as a national model of excellence in programming for artistic youth. Ryman Arts' core values—excellent programs, close personal connections with each student, and belief in the potential of young people navigating the path to adulthood--remain as strong as ever and are directly aligned with the values of Sharon Lund, our other founders and the inspiration of Herb Ryman. We are grateful to the Lund Foundation for its continuing investment in the students who participate in Ryman Arts. Make a contribution to the Next Generation Endowment Campaign today to support future young artists. 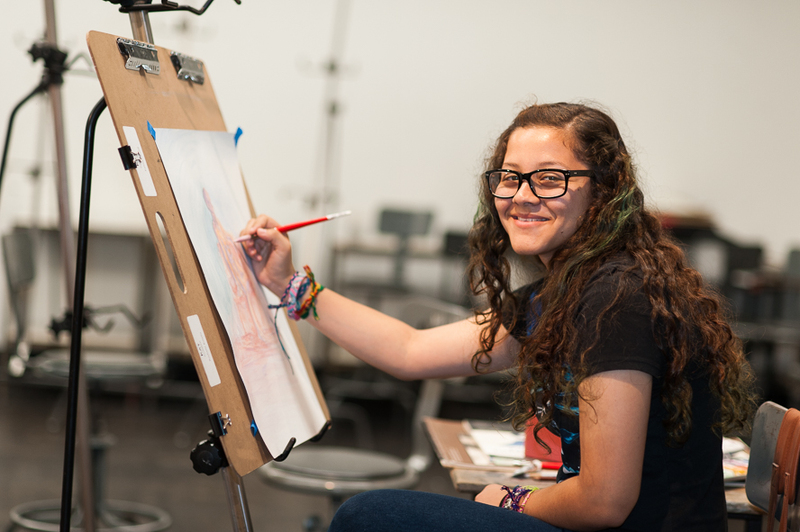 Image: Katherine Guzman (Ryman Arts ’16) sketches and paints from live model in Intermediate class. As our endowment grows, we will ensure that Katherine and future generations of Ryman Arts students will continue to receive a tuition-free fine arts education.